A couple of Japanese cucumbers followed me home from the market. They lay in my crisper all slender and green. They seemed to be taunting me, and all other tubby cucumbers out there, with their lean taut bodies. So smug they sat, unblinking, secure in the knowledge of their perfection. I made short work of them. Oh yes I did. Now they are pickled for me to enjoy at my leisure…their crisp tart deliciousness. I used to strongly dislike pickles. Once upon a time, when I was just a little girl, and all the pickles I knew of were sweet pickle relish (which I can’t eat to this day) and sad dill pickles that had sat too long on a supermarket shelf. When I started cooking however, I discovered a whole other world of pickles. Pickles that were far afield from the sad specimens of my childhood. Pickles you made yourself with ingredients carefully chosen and infused with all kinds of different flavors. Pickles from all over the world – Japan (I love Japanese pickles! ), Slovakia, and right here in my beloved islands. I don’t have an actual pickle recipe, as I’ve mentioned here. Since my pickles are done in small batches and stored in the refrigerator (as opposed to long-term storage for my non-existent winter) I don’t go through strenuous sterilization procedures. I usually use a base of vinegar, salt, and sugar, then add whatever else, by way of herbs and spices, that suit my present mood. With these Japanese cucumbers I used rice vinegar (delicious for pickles!) and a lot of freshly cracked black pepper (which I love with cucumber pickles). Some salt, some sugar, and a short nap in the fridge to chill, and they are ready! Excellent side for fish or grilled pork, or tucked into a ham sandwich. Aw, I've loved sweet pickles from the start 🙂 And I can eat dill pickles to some extent (not excessive). "Fresh" pickles are a great way to dress up the same old veg! I'm salivating now while you're writing about cucumbers. 🙂 Mine is not pickled but it's a salad of large cucumbers that has been peeled and diced, add some rice wine vinegar, sugar and salt. I just started to love cucumbers. 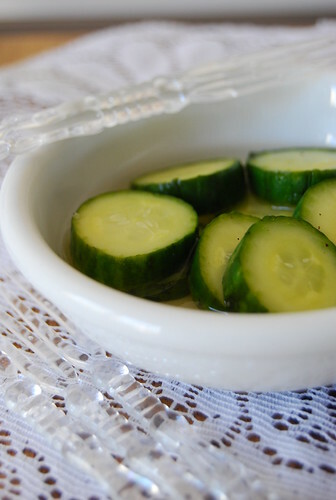 These pickles are fabulous to try. Simple things are sometimes the best. I love doing a quick pickle to go with a Japanese dish(or any other). It just adds freshness. Hi Divina! That salad does sound good! And yes, sometimes simple is indeed the best 🙂 Especially if you’ve been up all night feeding a hungry little pooper! Hi Ed! Freshness is good, especially now as we approach summer over here! do you have any recipe that i can try feeding to my very picky child. one with leafy greens perhaps. I love pickled foods, actually–I think I'm a bit addicted! Pickling makes anything tastes more exciting. I even eat pickled garlic right out of the jar but I get made fun of for that one! I was just dreaming about pickles this week after having a fantastic side of pickled banana peppers with crab cakes at a restaurant. These look great! Hi RJ’s Mama! Thanks for stopping by 🙂 My little one is still only 2 months old so I can’t give advice yet on what to feed a solids-eater…perhaps I’ll be stopping by your blog soon for tips! Hi Redmenace! Pickled banana peppers sound delish! As you probably know (because I am boring and repetitive!) – I LOVE pickles! These look beautiful. Rice vinegar makes gorgeous pickles I agree. Hi Jo! I never was a pickle fan until a few years ago – same thing – had bad experiences with the bottled stuff! But fresh pickled veg – that's a different story! Those cucumbers look perfect – delicious and as you said, a great idea to preserve them so you can enjoy them anytime and not feel guilty that they are going to rot in your fridge! Hi Helen! Haha, I am in good company then 🙂 Love the flavor of rice vinegar! Hi Trissa! Ah, you know from where I’m coming then 🙂 Yes, making fresh pickles out of the odd veg give you more leeway time-wise in their consumption…gotta love something that is delicious and practical! my salivary glands were constricting while i was reading your post…haha! ilove anything pickled esp cucumber… singkamas and lately i discovered the love for pickled radish…yum! Hi Malou! MMM…singkamas and radish pickle are also very good! Check out the link to Marketman’s pickles I have on this post…lovely! Love pickled veggies. One day I will be brave enough to make my own. For some reason very intimidated by the idea. yum! my dad is the only one at home who hates cucumbers, especially when pickled. I love it. BTW, I have extra takuan (the yellow japanese radish), do you want it? I have more than enough to last me a long time. I'd be happy to give it to you.